When you break it down, there really aren’t that many holidays you can’t celebrate with a little something you sewed. But that gets trickier when you’re making a gift to give for that holiday. And it is further complicated when the recipient is a dude and the holiday involves much pink and fluffiness. Take Valentine’s Day. I don’t get super serious about Valentine’s Day, not really, but a card is nice, maybe some flowers. Then we can all move on. Some folks get a little more into it, and they enjoy a meal out, maybe some tickets, something commemorative. Right on. I’d love to make something for my husband this year, but let’s just get it out on the table: I won’t be making him the pillow above. It’s precious and would be super fun to make, but there is no way in creation that my husband would put this on our bed. Or in his office. Although I’d love to have a photo of that, just for kicks. I’ve dug around the World Wide Internet Web a bit today, seeing if there were some great projects out there, and pickings are pretty slim, ladies. Not much to be had in the sew-for-my-man-but-not-pink-and-fluffy-or-likely-to-make-him-hide-it-in-a-drawer-so-he-won’t-have-to-hurt-my-feelings department. I doubt he’s going to do much with a heart-shaped…well, much of anything, actually. He’s a very sensitive and affectionate guy, but he’s not at all pink and fluffy. 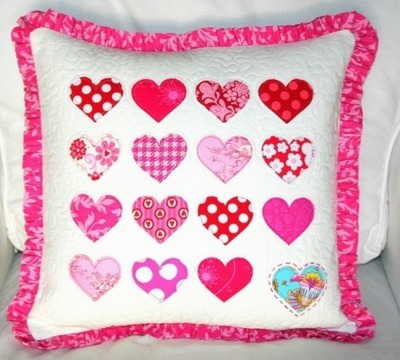 So my question is this: what do you sew for a MAN when you’re sewing for Valentine’s Day? I would be thrilled to have some suggestions, but I think we can do better: how’s about we make a game of it? Leave your suggestion in the comments for a man-friendly sewing project to give as a gift this Valentine’s Day, and I’ll pick the funnest one* to work up a tutorial, to be posted on the blog for FREE before the big day rolls around. Sound fun? I don’t have any idea what to expect, but I know y’all have some amazing ideas–I say, share one that you’ve got floating around and haven’t figured out how to make yet, and I’ll do the math for you! Or maybe there’s one that you feel ought to be out there in the world, but you’re not in the place to make it–let me do the work. We’re all winners! Comments will be open through Friday, when I’ll announce the chosen idea and begin working on the tutorial. Tutorial will be posted by February 6. Oh, and let’s keep it PG-13, if we can, y’all. You’re all very nice girls, but some of the articles I read while researching this little project were a tad…ahem…specific. I think we can do classy, witty AND crafty, don’t you? *This is totally subjective and based on what materials I have on hand/what I think will make for a fun project–but I’m open to informal voting in the comments, too, so let me know your idea and feel free to give a shout-out if you see someone else’s that rocks! ← Giveaway at True Up–One Spot in the Essential Sewing E-Course! I’ve thought about making my guys (DH and the 3 boys) a lined men’s toiletry/shaving kit. The boxy kind with a center zip and a handle on the end. My husband already has two of these, but when I read your comment, I instantly thought of our son: traveling to Gramma’s, taking his “nighttime underpants” and toothbrush/Thomas the Tank Engine toothpaste. And in wool plaid! How sweetly little-manly. i will be watching this closely for ideas! this isn’t particularly romantic, but i made my husband a “garbage bag” for his car to collect all the wrappers, etc. it velcros around the headrest support of the passenger seat, so it is easily removable if he has a passenger or if he wants to empty it. to make it personal, i used a spoonflower fabric commemorating one of his favorite tv shows (doctor who). You say it isn’t romantic, but this was another idea my husband really liked. Except I think he wanted to put it in my car. I am enchanted at the idea of tweed-meets-bento. We try to send a lunch with my husband most days, and as kitschy as I think it is to send him with a little kid lunchbox, he’s not feeling it–I bet he’d like this better than a grocery sack, by far! Steering wheel cover! My boyfriend bought his car used and the steering wheel was torn up, so he had to immediately buy a cover for it. You’d really only need 1 good manly fabric, and I can totally imagine him loving something with rockets or, if going the non-cotton route, a jazzy looking pleather type material. My husband thought this was an awesome idea–he really hates getting back into his car, even in the parking garage at his office, and having the wheel be super cold all winter. Would you make it padded/quilted? Does it just have elastic around the edges? Hmm. I thought it had Velcro on it, but he says it doesn’t have anything…but then again, he loses things all the time so what does he know. I would imagine that this would require some interesting measurements. If I were to make it I would probably scout out some store-made ones first [market research]. Maybe some form of boning? You know like those slap on bracelets from the early 90’s? So you could just slap it around the steering wheel. But then again, elastic would probably be simpler, like the concept of a shower cap but without the material in the middle? Ok I went and looked. His cover takes up half the circumference of the actual outer circle of the wheel, like the part that you can wrap your hands around. It’s very snug on it, and has grippies on the underside, like what are on the bottom of slipper socks. If you can find something like that, I feel like you could measure the circumference of the wheel so you know how long your tube needs to be, and make it a smiiidge smaller. Then layer your fabric, a layer of flannel [so its not too bulky], and the grippy layer [facing the wheel, not the flannel], and sew. Quilting it would provide some good texture, because you obviously don’t want his hands to slip while driving. I’m not sure that was helpful or even remotely readable, but I’m glad he liked the idea! My husband liked this idea to. I looked at some in the store but they were lined in rubber like stuff. I bet elastic would work though. My husband also said I would have to make him matching seat covers to go with. I like this idea. In the summer time, and even on some warm winter days here in FL, the steering wheel in the car literally burns your hands for the first several minutes of driving. I may have to hunt around for one of these tutorials. I live in Florida too, so I feel ya! Well, my viking will wear bracelets. I’m considering sewing up some embroidered cuff bracelets that are manly enough for him. He’s into leather work (think like leather armor, not the other nsfw kind), as well, so maybe something reminiscent of that. Viking! Leather! Must see pics. It sounds kind of lame, but placemats/napkins. But not the nice color-coordinated-to-the-dining-room ones I like. I mean themed ones, with bicycles, or coffee, or maps. The kind my guy would actually notice. Or, of course,flannel pajama pants! Not lame! And what if they came with some kind of picnic coupon or something? Like, a whole themed gift, where he gets tableware to use now, and the promise of a warm-weather outing to use them again later? Too much? My husband likes skinny ties, but sometimes they are hard to find, especially since he is freakishly tall and has to sometimes buy super-long ties. I’d love to be able to sneak a couple ties he is “meh” about because of their width and magic them into skinny ties as a surprise. I’ve seen some patterns for some “willie warmers” – but how about some good ol’ boxers, since we’re trying to keep it PG-13? My hubby usually wears his out and can always use another pair! Nothing says I love you like clean underwear! HYSTERICAL. And also: NSFW, for real. Wow. My husband listens to podcasts or the radio while he walks the dogs, and I think a scarf with a phone/iPod pocket would be cool. Or even a stretchy armband thingy–my husband likes to use his phone, but same idea–and he’d take it running if he had a good way to keep it stable and sweat-free. Or any organ, right? Didn’t it used to be believed that love began in the spleen? Let’s embroider spleens and watch their confused faces! A padded themed cover for his i-phone/i-pad/kindle or whatever based on his favourite thing. For my husband it would be based on fantasy roleplaying so would have an applique of a dragon or wyrm or something along those lines. Padded is the key! There are some great tutorials out there with a variety of closures–I might have to do a round-up of some of the manlier ones for us all to use for reference. When I first got my sewing machine last summer (and discovered you and this Web site and your book! ), I saw a tutorial for how to make an awesome clutch handbag out of the arm from an old tweed suit (including the lovely old silk lining). It looked all nifty, with a magnetic closure and cuff/buttons positioned just so on the purse’s flap. My husband became obsessed with it and still asks when I am making myself one because it’s so adorable and cool. I’d LOVE to see that tutorial if you can find it! I am steadily obsessed with all things tweed… Delish! Haha! For this to fly at our house, those slippers would have to be lined with fur. Oooh, that *would* be a great pattern to have on hand! I think for my husband it would have to be zip-front, since I don’t really like pull-overs on men over 35 all that much. I haven’t made a hoodie before–how hard could it be, right? Man-woobie is my new term-around-the-house. That is so perfectly picturesque. And I agree: they will never let us toss out all those sentimental shirts, but we certainly can’t allow them to leave the house *wearing* them, either. I have been known to do some judicious editing when packing/moving, but this would be the kinder way to reduce volume with respect. I made a tshirt quilt for my boyfriend last year with his favorite college team (Alabama) tshirts! He loved it and showed it to everyone! I also mixed in some flannel that was in his team colors, and trimmed with houndstooth! A wallet would be great! It could be out of something manly like denim or corduroy, or my husband is into super heroes… I can picture denim on the outside with some fussy cut Spider-man credit card pockets inside… And maybe a little pocket specifically for love notes? Love note pocket!! LOVE that! And I like the idea of it being textured and “manly” on the outside, but having something whimsical and very specific to his tastes on the inside. Shoe bags for travel and for him embroider or somehow mark the type of shoe that the bag is for, running shoes, black dress, brown casual etc. Another idea for travel is a type of roll similar to a jewelry roll but for all the cords etc. that we travel with now. Again I’d think it would help to identify which cord went in each slot as a reminder to pack his cords. Another is a bag lined with plastic for wet bathing suit,oh yes another reminder- to take it off the shower rod. And while I’m at it a bag for dirty clothes so they are not repacked with his clean ones. One more is a dry cleaning bag for his closet so it NEVER gets mixed with the laundry. Hmmm… Somebody knows her way around a suitcase! I love all these ideas–especially the one about the cords when we travel, because how great would that be?? I know I have lost more phone chargers by traveling and leaving them behind… My husband already has a dry cleaning bag and a laundry bag with which he travels, but the swimsuit thing is genius, especially in hot climates like ours–don’t ask me what happens when you toss a wet suit in with dry laundry and then travel in 90+ degree heat. Yuk. Love this idea for a clever cord roll-up. When we all travel together on a long-haul for the holidays, we carry along the “snake bag” full of cords – so named because it looks like a bunch of snakes have been stuffed into it! I was going to say IPAD or Kindle cover, but someone already suggested that. How about some manly but comfortable pajama pants! Uh, now you’re just making me feel bad: I never did get those Grinch pajamas done. Moving took over. Do you think it’s weird to give Grinch pajamas for Valentine’s Day?? Every day is a good day for Grinch pajamas! And I second and third the pj suggestions- I made a bunch for my husband for Christmas, and he was thrilled. Pants that were actually the right length! And comfortable with things he liked on them! And way easy, especially if you ditch the corporate pattern suggestion of hemming them AFTER the legs are sewed- are you crazy? Hem them when the leg is still flat with only 1 side stitched, then you just go straight across instead of in a circle, and it’s 10 times easier! I saw a tie at my local fabric store made with a (3sisters or 3women I think ?) print of a map of Paris. I have been wanting to make one for the hubs for a couple months now. I think it’d be great to find a good way to personalize it further – say with fabric that shows a map of significant places to your relationship (I saw something like this floating around on pinterest, but not in a wearable form). ideally this will end up as something awesome yet subtle, wearable and totally from the heart. I have that fabric! What a PERFECT use for it, too. And I bet you could scan some art into Spoonflower and get very specific, romantic fabric made…. What a lovely, thoughtful gift that would make… Plus, I’ve seen a lot more ties these days made from quilt-weight cotton, and they turn out great: nice, but not too dressy, just right for a dressy-casual gathering or evening out. I love the ideas so far! My husband has the charming habit of always putting his wallet and watch in exactly the same spot so he’ll know where it is the next morning. It’d be great to make a little boxy organizer for him to put it in instead of plunking it down on top of the desk. I’ve struck out in the hand-made dept many times when it comes to gifting him (knit hats, slippers), so it’d have to be a low-risk investment. I remember my dad had the world’s coolest dresser-top organizer that I loved to look through — it kept coins, nail clippers, prayers cards, misc. medals and trinkets that he wanted to keep (a few of them were child-made). 3 open compartments and one with a lid. I was just thinking of something like this yesterday! Actually, I was wondering how hard it would be to make it out of leather. I think a very nice leather “bowl” to organize his man things would be awesome. I am an embroiderer – so I would embroider something beautiful inside his favorite suit. Sarah Loves Me or something to that effect. It would be just a hidden little reminder of me every time he was dressed up. I can think of nothing more subtle or secret than that. I LOVE this idea. Like, LOVE it. I don’t think I’d be brave enough to do it to his very most favorite suit, but I bet I could get away with putting it inside my favorite suit to see him wear! A super warm lined hat and matching gloves in red plaid with a homemade tag on the inside that says I love you. If we lived in a colder climate! Actually, I think my husband would love this, but might prefer the hat to be knitted–he really likes to wear them snug against his ears on those rare occasions when he skis. Ooh, great ideas! Mine is a little boring, but with the right fabric and a lot of love, my hubby would love it! Silk boxers in a really great pattern – something modern, sophisticated, manly – not “Valentine’s cheesy”. I don’t even know where I would find silk fabric like that, and I’m a little too chicken to try sewing with silk yet! I forget who publishes it, but somewhere out there is a great boxers pattern with a rear gusset–a lot of them don’t have that, and I’m told it’s not terribly comfortable for the gentleman who wears them. I haven’t found silk super difficult to work with–just use a smaller needle in your machine and take your time cutting. Consider taping the fabric to the cutting mat and using a rotary with pattern weights to keep it from sliding all over the place–silk boxers sound luxurious! How about a cool flannel scarf with just a tiny heart embroidered on the inside to say “love you”? Or a “man-woobie” out of old flannel shirts or sweaters (thrift store) and again – on one corner just hand embroider a little red heart. Part of me is thinking that it would be so easy to make something he really wants and add just a smidge of Valentine’s, like you’re talking about. Subtle is the new Romantic. I think something like this would be fun! You could crochet, or sew the legs. Use some fabric starch? I love the legs with red high heels! My idea probably doesn’t apply, but my man wants me to make him the most fabulous backpacking hammock tent thingy. It would keep away mosquitoes but still let him sleep in lightweight hammock. It doesn’t exist to buy. He created the idea out of this own genius head and I get to make it. Aren’t I lucky? My husband keeps asking for a pillow with some techy symbol on it. Like @ or something. He’s kind of a geek. One of my husband’s favorite things is his diaper bag. You have to see it – it’s a KISS Destroyer bag. http://ep.yimg.com/ca/I/yhst-39750702637116_2192_156961766.jpg He gets compliments on it everywhere he goes. From men, women, kids, etc. I think it’s hideous but he loves it. Hey, whatever gets him to carry the diapers. Anyway, it makes me think of making a “manly” (ahem, ugly) bag for other uses. A computer satchel with a big image like that on the flap he would definitely carry. Either upload an image to Spoonflower, or use an existing T Shirt, or laminate a printed image perhaps. The nfl logo fabrics are ok for this but not quite as original as the inspiration bag – I’d rather have a big old logo on the flap than use the printed nfl fabric I think. Perhaps fabric paint and freezer paper stencils? I like the “Be A Man” prints if they could coordinate. PJ pants, robe. Have made both. Love the man-woobie concept, have also made a fleece/reversible one for my husband to use in his man chair. I have to wrestle it away from him to throw in the laundry. But I was thinking about some kind of sturdy canvas tool bag with handles. All the cool HGTV guys have them! This one would not be huge, though, just big enough for the basics – hammer, screw drivers, pliers, etc. Could be for home or car. Or a lighter weight one for shoe polishing supplies. Or a bag with emergency supplies for the car – flashlight, bottled water, granola bars, blankie. That man-at-work collection you had last year (?) would be a great choice for contrast. My husband has been asking me to come up with some sort of pillow-like holder for his mp3 player so that he can listen to music in bed. I’m up all night if there is music playing, and he can’t seem to get to sleep in silence. We could call it the sweet-sleep pillow! Such a device could do wonders for or marriage. I just started learning how to sew! I love all these ideas, especially ghe ones to help organize stuff in suitcases and a travel case for shaving stuff and toiletries!! I think I’m gonna make this stuff, but will keep watching for more ideas! Thanks again! !